As we celebrate the treasured legacy of Mister Rogers on Mountain Lake PBS this month, with the PBS premiere of Morgan Neville’s acclaimed documentary “Won’t You Be My Neighbor,” and a brand new interview with singer François Clemmons, we’re taking a closer look at this gem from the Mountain Lake PBS archives. Clemmons opera and gospel-singing career took off when he began appearing as the musically gifted police officer on “Mister Rogers’ Neighborhood.” Producer Paul Larson first interviewed Francois Clemmons at Middlebury College, where the artist in residence would entertain with spiritual songs. Clemmons retired in 2013. This archival segment from “Art Express” was produced in 2004. “Won’t You Be My Neighbor” airs on Mountain Lake PBS and on HBO Saturday, February 9 at 8pm. Previous ArticlePaul Larson Talks Mr. Rogers on The Z! Musician Yanni revisits a time when he nearly gave up his career in music. The puppeteer behind Big Bird takes talks about laughter, life and learning on Sesame Street. 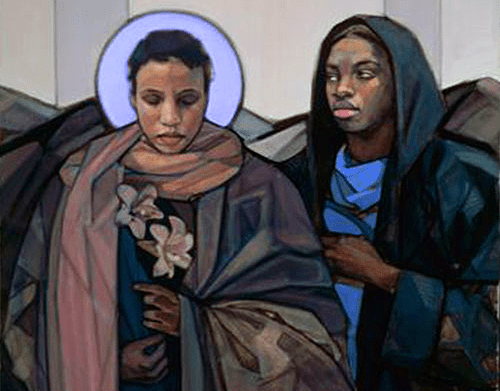 Vermont artist Janet McKenzie receives compliments and criticism for her racially diverse religious images. Tony-winning Broadway actor John Lloyd Young chats about his starring role in Jersey Boys. Jerusalem provided a historic and mystical backdrop for a special program about art and architecture in Israel. Violinist and PBS performer Andre Rieu invited me to the Netherlands two summers in a row to interview him in his charming hometown of Maastricht. 4D Art presented the technologically dazzling Anima on Art Express before the spectacle toured the globe. Enjoy full-length versions of stories from AHA! WMHT (PBS Albany) has joined Mountain Lake PBS to showcase Paul Larson's arts features from the North Country, Quebec, and beyond. Art Express has won three awards from the New York State Broadcasters Association for "Outstanding Locally Produced Show." ART EXPRESS celebrates the visual arts! ART EXPRESS applauds the performing arts! ART EXPRESS examines PBS personalities! Violinist and PBS performer Andre Rieu invited Paul Larson to the Netherlands two summers in a row to interview him in his charming hometown of Maastricht.